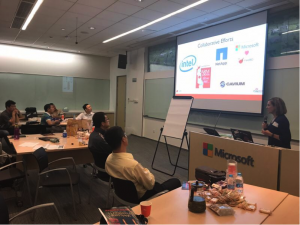 Since I was already going to be in Beijing, and LinuxCon China was being held right before the COPU event, Microsoft invited me to be part of a women-in-tech panel they were sponsoring. There were six of us on the panel including two from Microsoft, one from the Linux Foundation, one from Accenture of China, and one from Women Who Code. Two of us spoke in English, with everyone else speaking Chinese. It was disappointing that we didn’t have translators, because I would have loved hearing everyone’s answers. We had excellent questions from the audience at the end. I also had a chance to talk with a journalist from Beijing, where I emphasized how contributing to an open source project, like FreeBSD, is a wonderful way to get experience to boost your resume for a job. The first day of LinuxCon also happened to be FreeBSD Day. I had my posters with me and was thrilled to have the Honorary Chairman of COPU (also known as the “Father of Open Source in China”) hold one up for a photo op. Unfortunately, I haven’t been able to get a copy of that photo for proof (I’m still working on it!). We spent a long time discussing the strengths of FreeBSD. He believes there are many applications in China that could benefit from FreeBSD, especially for embedded devices, university research, and open source education. We had more time throughout the week to discuss FreeBSD in more detail. Since I was at LinuxCon, I had a chance to meet with people from the Linux Foundation, other open source projects, and some of our donors. With LinuxCon changing its name to Open Source Summit, I discussed how important it is to include minority voices like ours to contribute to improving the open source ecosystem. The people I talked to within the Linux Foundation agreed and suggested that we get someone from the Project to give a talk at the Open Source Summit in Prague this October. Jim Zemlin, the Linux Foundation Executive Director, suggested having a BSD track at the summits. We did miss the call for proposals for that conference, but we need to get people to consider submitting proposals for the Open Source Summits in 2018. I talked to a CTO from a company that donates to us and he brought up his belief that FreeBSD is much easier to get started on as a contributor. He talked about the steep path in Linux to getting contributions accepted due to having over 10,000 developers and the hierarchy of decision makers, from Linus to his main lieutenants to the layers beneath him. It can take 6 months to get your changes in! On Tuesday, Kylie and I met with a representative from Huawei, who we’ve been meeting over the phone with over the past few months. Huawei has a FreeBSD contributor and is looking to add more. We were thrilled to hear they decided to donate this year. We look forward to helping them get up to speed with FreeBSD and collaborate with the Project. The honorary chairman, Professor Lu in the front middle. Wednesday marked the beginning of COPU and the reason I flew all the way to Beijing! 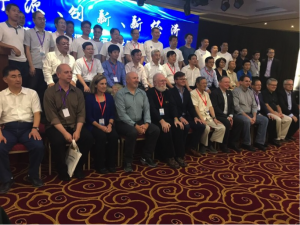 We started the summit with having a group photo of all the speakers:The honorary chairman, Professor Lu in the front middle. Teaching Students About Open Source – he stressed how they graduate 8 million students every year and those graduates need jobs. In China, they promote entrepreneurship for young people. There are 7 million companies with 1 to 2 people, and open source is the foundation of many of these start-ups. He believes the best talent are open source developers. There were presentations from big corporations like IBM and Microsoft, and then from many smaller companies, universities, and open source projects. My presentation was called “FreeBSD Advantages and Applications”. A lot of the material came from Foundation Board President, George-Neville-Neil’s presentation, “FreeBSD is not a Linux Distribution”, which is a wonderful introduction to FreeBSD and includes the history of FreeBSD, who uses it and why, and which features stand out. My presentation went well, with Professor Lu and others engaged through the translators. Afterwards, I was invited to a VIP dinner, which I was thrilled about. The only hitch was that Kylie and I were running a FreeBSD meetup that evening, and both were important! Beijing during rush hour is crazy, even trying to go only a couple of miles is challenging. We made plans that I would go to the meetup and give the same presentation, and then head back to the dinner. Amazingly, it worked out. We had around 15 attendees at the meetup. I quickly found out that less than half of the attendees understood English and learned that I should have made my slides bilingual. Fortunately, Kylie helped translate as I went through the presentation. Besides Kylie running the meetup, a local COPU attendee, who used to run a Linux user group in Beijing, also joined us. He’s interested in helping run the FreeBSD meetups in the future, which would be helpful, since Kylie isn’t located in Beijing. Getting a taxi back was a little more difficult, but with the help of Kylie’s boss, she managed to get me one. By the time I got back to the hotel, everyone from COPU had finished dinner, but the Chairman of COPU (note, not the honorary chairman!) was still in a meeting and said he’d meet with me after I grabbed a bite to eat. The COPU Chairman hadn’t attended the earlier presentations, so through his translator, he asked me many questions about FreeBSD. We must have talked for over an hour about FreeBSD with me answering his questions such as : What is FreeBSD? Why use FreeBSD? Who uses FreeBSD? What are successful application examples. ?He also asked why they only hear about Linux and why its so popular. I went over the history of FreeBSD; the lawsuit and how that set FreeBSD back just when large companies started embracing Linux; the benefits of the BSD license; the research being done on and with FreeBSD;and the efforts in place teaching with FreeBSD. I felt like it was a successful meeting. He would like to meet with us again in the near future. Round table discussion at COPU. On Thursday, as you can see in the photo above, many of the speakers sat in a “circle” to discuss open source. I didn’t know what to expect here and what the expectations were. I listened at first to what others said about their projects and open source in China. A professor from a local university asked how to incorporate open source in their curriculum. This is something we’ve been talking about within the Project. I decided to speak up at that point about getting experience working on open source in college and how that can open doors in the real world. I gave the story of a boy from Ukraine who migrated to the US, lived in government housing, and who was introduced to FreeBSD in high school. His experience with FreeBSD opened the door for a job at a startup called Yahoo!, followed by co-founding the successful messaging company, WhatsApp. By telling Jan Koum’s story, it highlighted how FreeBSD can help give students the experience they need to be prepared for the job market. Overall, attending these events turned out to be very valuable for the both the Project and the Foundation. 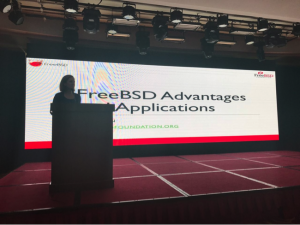 There are many opportunities for FreeBSD in China, and we’re just starting to explore these with the help of board member Kylie Liang. We are also starting to hear of some major companies in China using FreeBSD, and are beginning to connect with a thriving FreeBSD community. 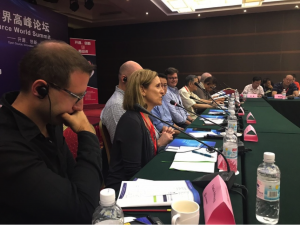 Our purpose is to promote, educate, and raise awareness of FreeBSD in China; help facilitate collaboration with the Project; and get more students using and learning about FreeBSD. We’re doing this by running meet-ups, meeting with Chinese companies and organizations, and giving FreeBSD presentations at more open source conferences in China. Maybe someday soon, we’ll have a BSDCon China!